I went wakeboarding with my family this weekend at Puddingstone in San Dimas. I’ve wakeboarded twice before this, but it was my cousins’ and brother’s first time. It’s a ton of fun, but I can definitely admit that I’m sore the next day. That video was my longest go. Thanks to my cousin Haley for recording! Here’s Mitch. He was definitely getting much better near the end, but I stopped recording when my phone got close to dying. Here’s Haley, who actually stood up briefly on her first attempt. She was pretty amazing. Lastly, this is my brother, James. He’s been on the boat previously, but this was his first time wakeboarding. I’m glad he tried it! 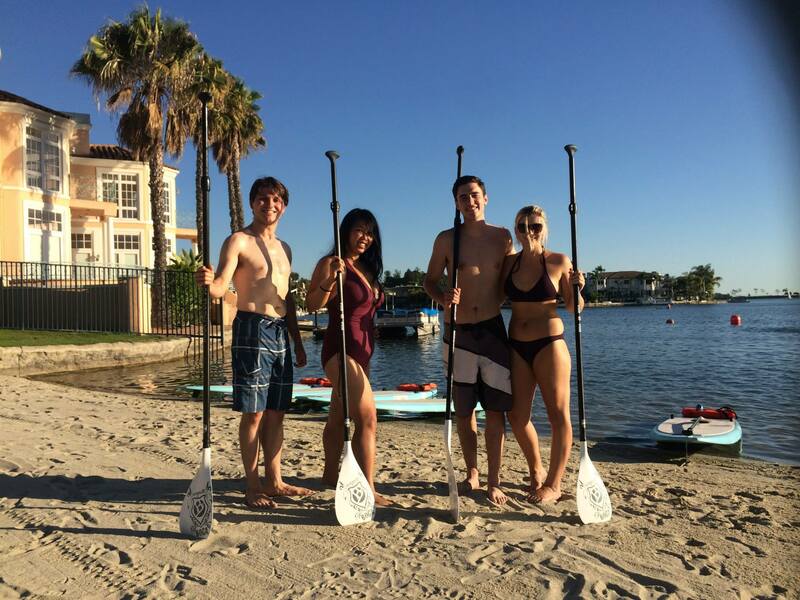 This entry was posted in Fitness, Journal, Sports, Videos and tagged boat, puddingstone lake, san dimas, wakeboard, wakeboarding, wakeboardingb on August 24, 2015 by TheUser. 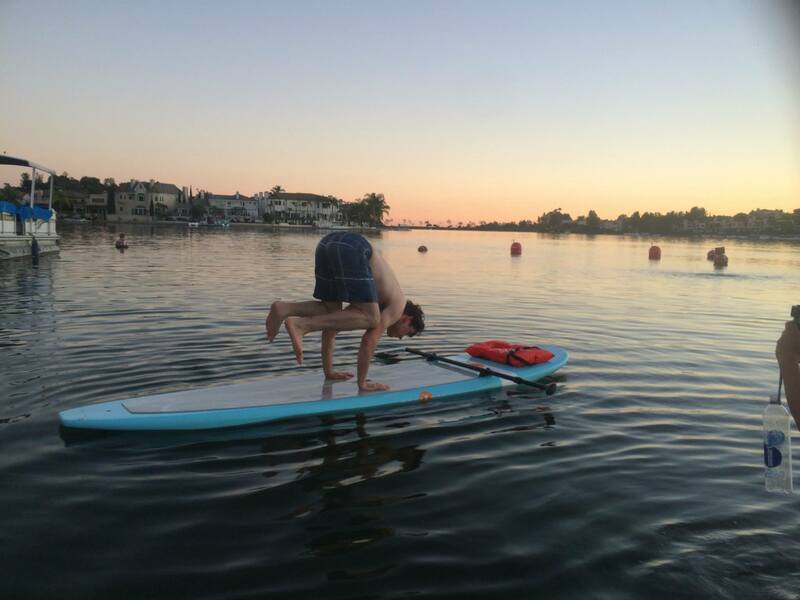 I took a sunset flow paddleboard yoga class recently that was an absolute blast. 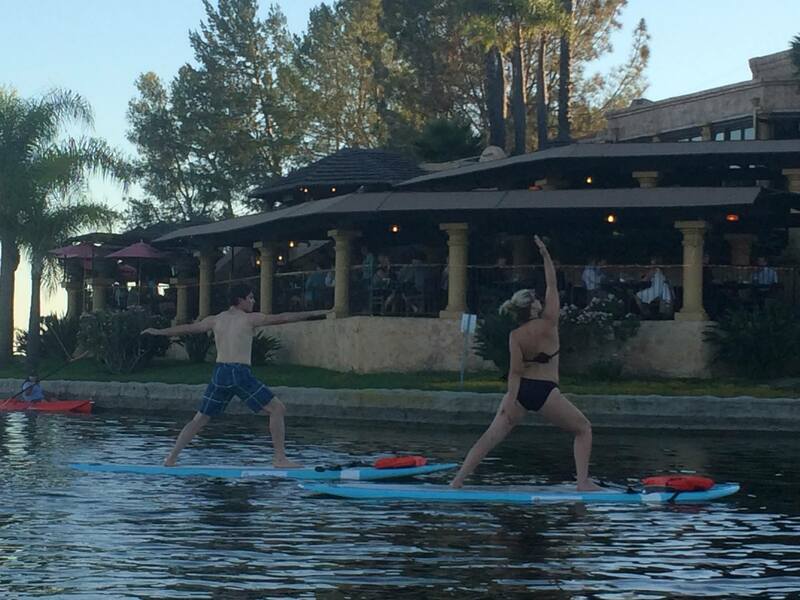 The class was led by Kelly Huck of SoCal Paddle Yoga. She was great, so if you’re interested, I recommend check that site. She also took the photos in this post! 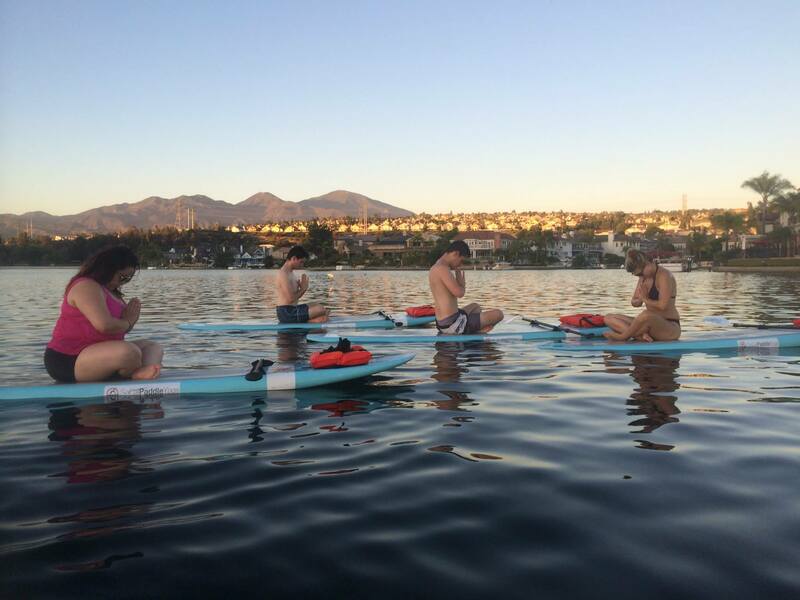 It was on a lake in Mission Viejo, which meant it was relatively calm, making for easier yoga. It was kind of weird following pose after pose while slowly drifting apart and sometimes facing haphazardly away from most others. I kind of liked the disconnect. It made it feel like I was in my own little world. I like headstands, so I couldn’t resist. 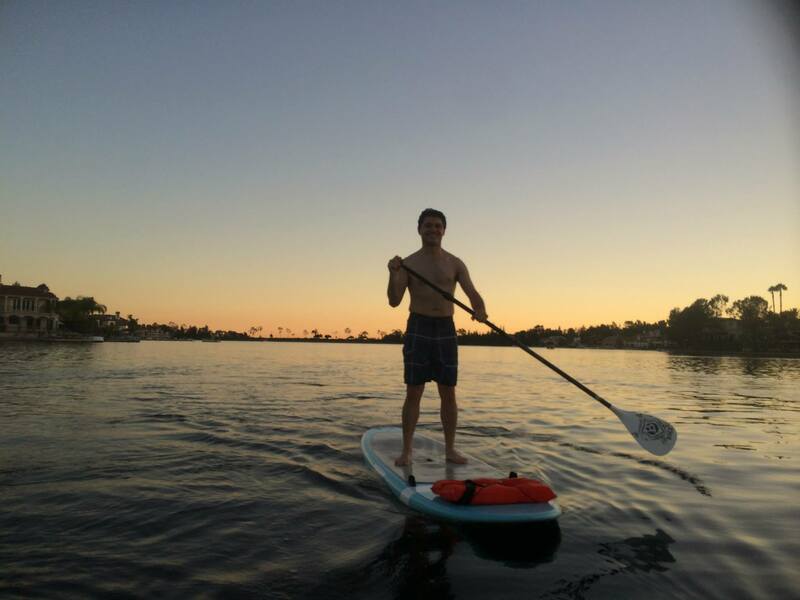 Crow is definitely much easier on a lake than in Newport. Unfortunately, the class had to end. I’ll need to go again! 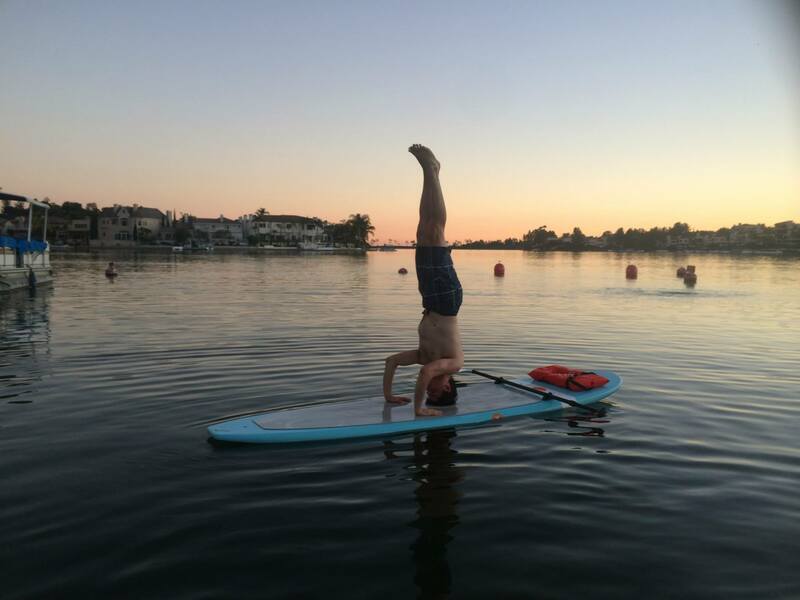 This entry was posted in Fitness, Journal, Photos and Screenshots and tagged mission viejo, paddle board yoga, paddleboarding, standup paddleboarding, SUP, SUP yoga on August 19, 2015 by TheUser. This weekend was fun for a couple reasons. First, there was a party for Duncan and Matt’s birthdays. We had dinner, socialized, and played some games. This is probably the only photo worth sharing. Yep, that’s a s’more with a Reese’s Peanut Butter Cup and giant marshmallow. This weekend was also the Long Beach Sand Sculpture Music & Art Festival. It was so much fun! I probably would have had the same amount of fun even if the festival wasn’t there and we just went to the beach haha. We had a tasty meal of Korean BBQ burritos from Seoulmate in the park before heading down to the beach. I used one of those giant, human-sized hamster balls and slammed into people. I don’t have any photos yet because they weren’t on my phone. It was fun, but it was hot. So hot. I also jammed my thumb back while inside, and it was aching all day (and more). It’s getting better though! When I got out, I was feeling dizzy from the heat and dehydration. We got some water and then went into the ocean to cool off. There were lots of cool dogs to watch as well as the sand sculptures themselves of course. I brought my DSLR out for the first time, and Luke helped me a ton. It was a hand-me-down, and I didn’t have the manual nor did I know much about it. I might not have the skill, but at least Luke explained what most things mean. I feel much better about using it now! We also visited a skateboard stand. Anela and gem got skateboarding lessons! They didn’t care about the guys. Oh, and I played with hula-hoops! It was super fun actually! This entry was posted in Art, Events, Food, Journal, Photos and Screenshots, Table-Top Gaming, Videos and tagged beach, birthday, birthday party, board games, burritos, dancing, eureka, hula-hoop, joe, korean bbq, long beach, Long Beach Sand Sculpture Music & Art Festival, sand sculptures, seoulmate, skateboarding on August 18, 2015 by TheUser. Spotify introduced the Discover Weekly playlist, giving users custom playlists of new music based on their usage. So far, it’s been pretty amazing for me. If you haven’t tried it yet, check Browse > Discover > Discover Weekly. Checking my Last.fm reveals that in the last week, nine of my top ten played songs were from my Discover Weekly playlists from the last two weeks. Spotify’s algorithms seem spot on; they certainly know what I like. Discover Weekly is a single playlist that’s updated every Monday. Because I want to save them, I make a new playlist that’s a duplicate of my Discover Weekly. When the Discover Weekly is changed, I still have my duplicate. One song it recommended was Obsessed With You by The Orion Experience. It recommended it to me two weeks ago with the introduction of Discover Weekly, and it’s now my 38th most played song ever according to Last.fm. That’s crazy. I guess I listened to it a lot. Whoops. Morgan Laurence – Come On! Come On! If you use Spotify and haven’t checked out your Discover Weekly playlist yet, you’re missing out every week you don’t take a look! This entry was posted in Music and tagged 5 years time, bar bar bar, beautiful small machines, come on! come on!, counting back to 1, crayon pop, discovery weekly, dixie flatline, f-cking boyfriend, garfunkel and oates, gay boyfriend, i fight dragons, just be friends, misterwives, morgan laurence, music, noah and the whale, obsessed with you, spotify, the bird and the bee, the geeks will inherit the earth, the orion experience, twisted tongue on August 5, 2015 by TheUser. My favorite podcast, My Brother, My Brother, and Me, recently had a entire episode sponsored by Totino’s. That’s hilarious all by itself, but the episode was pretty great. One fan wrote to the show discussing how he prefers to pan-fry his Pizza Rolls. I’d be crazy not to try it, right? Last Friday was Pizza Day as The Aquabats would say, so it was the perfect day to try it out. Thanks to gem and Anela for helping make the video and eat delicious Pizza Rolls with me! And the results? gem and I both preferred pan-fried Pizza Rolls. I thought they were awesome! We were in agreement that baked were next and microwaved were the worst (but still totally worth eating). Anela preferred baked over pan-fried but agreed that they were both better than microwaved. Well, two out of three isn’t bad. Thank you, Totino’s, McElroy brothers, and mystery writer to the show! 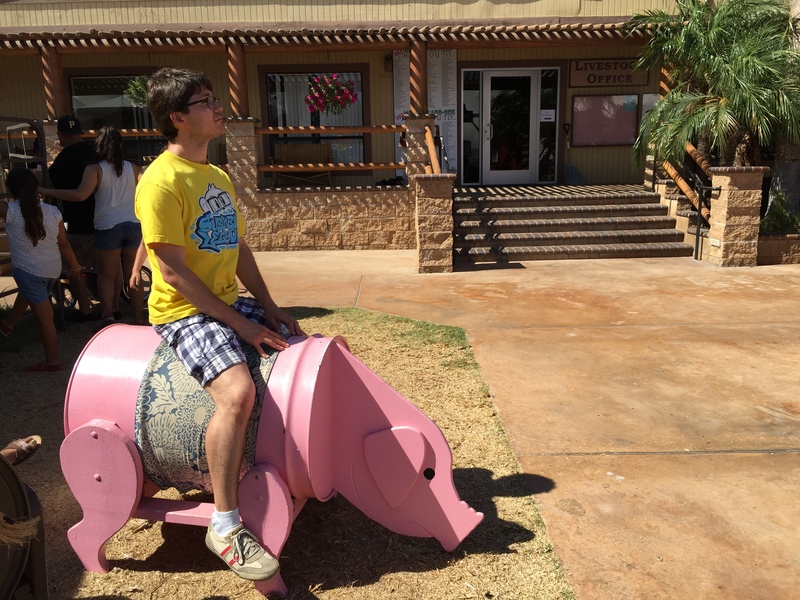 This entry was posted in Comedy, Food, Food I Prepared, Journal, Videos and tagged anela, gem, griffin mcelroy, justin mcelroy, mbmbam, my brother my brother and me, pizza rolls, totino's, travis mcelroy on August 5, 2015 by TheUser. In addition to the OC Fair about which I already posted, my weekend was full of some other things too. For starters, Antonio and I went with Anela to iHookah, where she danced. Thankfully, that’s a still photograph and not a video. In that case, let me assure you that Antonio and I are amazing dancers. Thanks to iHookah for posting photos! It was Antonio’s first time smoking hookah, and it was a good time. I really like iHookah too; they have great service, and the staff is super friendly. It’s fun to watch Anela dance too! I also hung out at gem’s a few times. On Friday, gem, Anela, and I had dinner, watched TV, and played Super Mario 3D World with gem’s brother. Sunday night, after the OC Fair, gem, Antonio, and I took turns playing Splatoon. It reminded me of being a kid! As usual, what a terrific weekend! This entry was posted in Art, Dance, Events, Gaming, Journal and tagged ihookah, OC Fair, oc fair 2015, splatoon, super mario 3d world on August 4, 2015 by TheUser. It’s that special time of the year where I eat terrible fried foods, watch bunnies, and look at all the cool competitions – the OC Fair! This weekend I went with gem and Antonio and had a great time! I definitely ate some bad food, including some fried Oreos. It’s not a fair without high calorie food. It was delicious, but my stomach did seem a tad confused at the terribly unhealthy food it received. I really enjoy looking at the collections every year. This ticket collection by John Dettle was one of my favorites (probably because I have my own). I assume they’re all tickets of events he attended himself, but I guess I don’t know for sure. I also love looking at the other competitions – food, place settings, photography and other visual arts, crafts, it’s all so cool. There were a lot of cool photographs and paintings, giving me a lot of cool inspiration and ideas despite not being super artistic myself. The place settings are always interesting too. This surprised me the first year I saw them; I didn’t expect to care, but I do! There were lots of neat crafts too. I especially like the scrapbooking! This rabbit was my favorite. He was super energetic, running in circles, climbing on his box, and jumping over his box. As soon as I had the idea to record him doing it, he stopped jumping over it. I was patient, and he eventually jumped over it for me! We played a coin tossing game, and gem won a small prize! She intends to give it to Sumo. I was hoping to win a minion so I could send a video to my cousins of Sumo chomping it, but I wasn’t good enough to win one. I ended my fair trip by taking photos of flowers! This entry was posted in Animals, Art, Events, Food, Journal, Photos and Screenshots, Videos and tagged carnival, collections, deep fried oreos, fair, flowers, minions, OC Fair, oc fair 2015, paintings, photographs, photography, pig, pigs, place settings, scrapbooking, scrapbooks, ticket collection, ticket stub collection, visual arts on August 3, 2015 by TheUser.